IMPORTANT NOTICE: The virtual plant includes a number of images -- THUMBNAILS are normally displayed.- DOUBLE CLICKING the thumbnail will access a high-resolution image. The Virtual plant has an on-line glossary. Clicking on underlined words, will pop up a small reference window, with relevant text, and an image, if this is available. The pop-up boxes are elastic and resizable. Click on this example, to see what happens, click me. Because each popup contains a different amount of information, you will have to resize it yourself (simply drag it with the mouse pointer). The Pop-Ups will close automatically after 30 seconds. Understanding secondary growth in plants. Identifying cells and tissues involved in secondary growth. There are three phases in the development of the plant viz.- the embryonic, the primary and the secondary. The primary plant body comprises the division and differentiation products of the apical meristems. This includes the procambium, which differentiates to form the primary vascular tissue. The secondary plant body is composed of the division and differentiation components of the fascicular and interfascicular cambia. In this exercise, we explore some stages of development in the secondary plant body, using a number of different examples, each of which illustrates various aspects of development of the primary and secondary plant body. Thumbnails of the specimens that are examined in this exercise. Click on these, to go directly to the detail pages. Cutler, Botha and Stevenson, Plant Anatomy, an Applied Approach and Raven, Evert and Eichhorn, Biology of Plants (6th or later edition) are highly recommended for additional background information. Bidens pilosa is a weed species. As such the prime object is rapid growth, niche occupancy, and flowering. In order to do this, some energy has to be expended on the production of mechanical support structures, in order for the plant to be able to successfully invade space and occupy a niche. As is typical of many of the weedy species, this means that the plant does not invest heavily in lignified tissue, but uses other strategies (such as partial lignification only and hollow stems) to provide enough mechanical support. Examine the illustrations of Bidens which have anatomy that is typical of a young dicotyledonous stem. 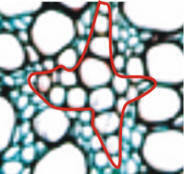 The Figure below shows the structure of a young stem at the end of primary growth. The Figure to the right shows details of the limited secondary growth that has occurred in this plant. Please refer back to the third exercise should you need to, to refresh your knowledge about primary growth. These micrographs illustrate the commencement of secondary growth in Bidens pilosa stem material. The micrograph to the left shows part of the stem, including the epidermis, outer and inner cortex, and the vascular bundles separated from the cortex by a starch sheath. This bundle is topped by an extensive band of perivascular fibres, which forms the innermost layer of the cortex of this stem. Note that cambial activity has spread beyond the confines of the vascular bundle, so what we are seeing here is fascicular (within the bundle) and interfascicular (between the bundles) cambia that have joined, to form the vascular cambium. The bottom micrograph shows part of a vascular bundle at higher magnification. 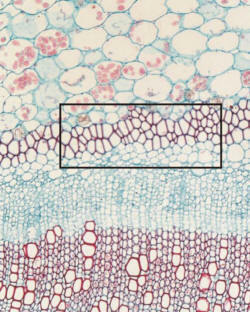 The vascular bundle is topped by a narrow band of primary phloem fibres, beneath which is the metaphloem. A fairly broad cambial zone 5-6 cells wide, between the primary phloem and a few secondary phloem elements that have been produced by the cambium. In both primary and secondary phloem, many of the the sieve tubes contain a darker-stained mass, possibly disrupted phloem proteins. The xylem visible in this photomicrograph is almost all secondary, including some narrow elements that have as yet, little lignin deposition in their secondary walls. Click here for a detailed look at the secondary xylem. (a) The cambial zone forming a ring of thin-walled, non-lignified cells, which run through the middle of each vascular bundle and across the interfascicular parenchyma. (b) The cambial zone consists of the true vascular cambium and on either side of it, the cambial derivatives, which are almost indistinguishable from it. The derivatives formed centrifugally are destined to differentiate into secondary phloem and the derivatives formed centripetally are destined to differentiate into secondary xylem. Note that the cells of the cambium are arranged in regular radial rows, that they are flattened tangentially, that the tangential walls are thinner than the radial walls and that the cells contain cytoplasm and nuclei. If seen in longitudinal section, you would notice that the cambial cells are elongated, with chisel-shaped ends. 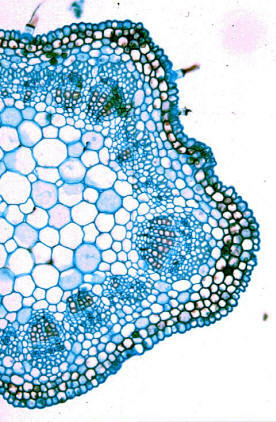 The secondary phloem - composed of sieve tubes and companion cells. Note that the centrifugal derivatives of the vascular cambium are formed in radial rows and that each sieve tube and its associated companion cells are formed from one cambial derivative, the pair remain more or less opposite the cambial cell from which they were derived. The cambial zone consisting of the vascular cambium and its as yet, incompletely differentiated centrifugal and centripetal derivatives. Remember that the cambium in the interfascicular region, is derived from an undifferentiated strip of cells, which occur between vascular bundles. The secondary xylem - a compact tissue of wide-diameter vessels narrow-diameter xylem fibres, with very thick walls, and radiating columns of ray parenchyma with more or less heavily lignified walls ( the latter will show up more clearly in the small vascular bundles). The components of the secondary xylem are arranged in regular radial rows. Look closely at the cambial zone in the interfascicular region. The vascular cambium is as mentioned, derived from interfascicular parenchyma and it forms secondary xylem and phloem in the usual way. Most of the derivatives in this interfascicular region will not have differentiated yet, as the secondary vascular tissue forms in this region only after it is well established in the primary bundles. However, it will be seen that alternate vascular bundles have more secondary vascular tissue and that this extends laterally, beyond the limits of the original primary bundle. In these regions, the interfascicular cambial derivatives have already differentiated into secondary xylem and phloem (mostly fibres in the latter case). Differentiation therefore spreads laterally from the interfascicular, towards the interfascicular region. Helianthus is an example of a plant in which secondary growth is limited in the stem to the vascular bundles. The most prominent development is associated with the phloem fibre cap, which becomes very extensive as the stem ages. This growth, together with the formation of secondary xylem, provides an efficient mechanically supported structure, in which minimal energy is transferred to the formation of non-essential mechanical tissues. Examine the detailed photomicrograph (please click on the image above) showing part of the vascular tissue of a young Helianthus stem. 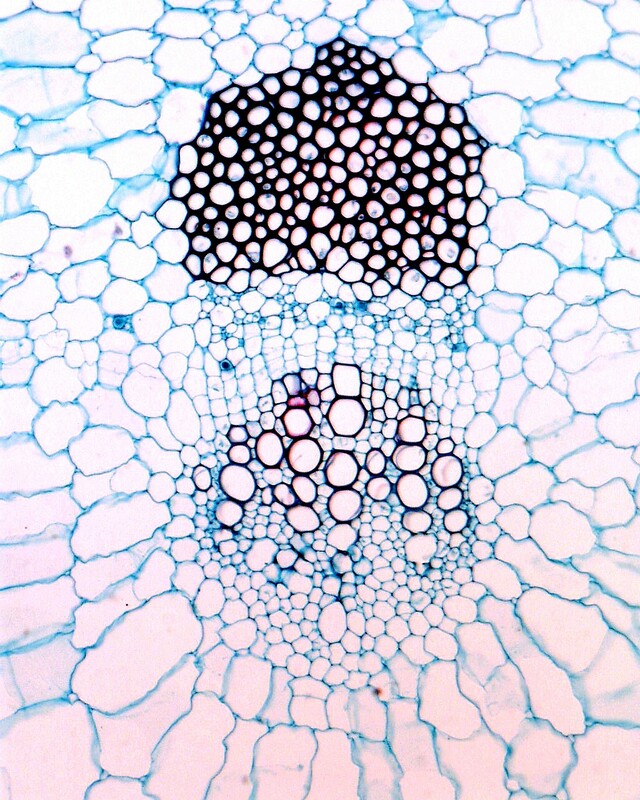 Now, look at, and compare the photomicrograph of a vascular bundle in a young stem, with the mature stem in TS. What is happening here ? Can you identify the ray parenchyma in the mature stem ? What process has taken place, which resulted in the formation of the large cap of fibres over the primary phloem? Has any secondary xylem and/or phloem been produced yet by the cambium ? Chrysanthemum is again an example of a plant which undergoes limited secondary growth. The stem will develop a conspicuous phloem fibre cap, which together with a pericycle (if formed) will provide more than adequate strengthening to the flower-bearing stem. The Epidermis - simple, single-layered, with thickened outer tangential walls. Note relatively thick cuticle. Cortex - consisting of parenchymatous cells (the outer cortical layer may be torn in places). 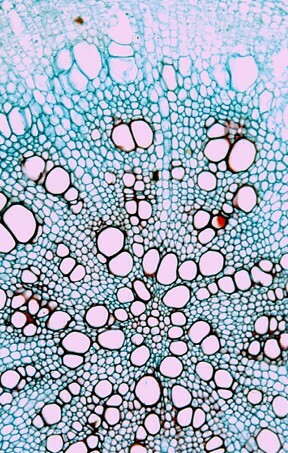 starch sheath - a single layer of cells, exarch to the primary phloem. Primary Phloem Fibres - Note that the walls of these fibres are still, for the most part, primary. Lignification is in the process of taking place in some walls. Primary Phloem - immediately beneath the fibres - contains sieve tubes, companion cells and phloem parenchyma. Can you identify the protophloem sieve tubes? Vascular Cambium - look carefully and note if it is entire. Is there any sign of secondary phloem differentiation from (a) fascicular or (b) interfascicular cambial regions? Secondary Xylem - confined to 1-2 rows of derivatives differentiating vessels, tracheids, and ray parenchyma. Primary Xylem - large diameter metaxylem and smaller diameter, endarch protoxylem. Pith - parenchymatous and entire. Question: Is Chrysanthemum an example of a dicot which undergoes unlimited secondary growth? Give reasons for your answer. Practice your drawing skills. You should draw an LP diagram, of pant of the stem, as well as a HP drawing, showing the structure of one vascular bundle. The thumbnails above to the right shows a stem that has undergone considerable secondary growth. The outer layers have been replaced by a periderm, and a ring of very thick-walled sclerenchymatous perivascular fibres interspersed with sclereids lies exarch to the secondary phloem. The detailed images show that the cambial zone (shown in the leftmost thumbnail for orientation purposes) consists of several layers of cells, indicating that the sections were made from actively-growing material. Click on the left image above, to see details of secondary growth and the right image, to see a detail of the lenticel which is involved in gas exchange. Pelargonium is another example of an herbaceous dicotyledonous plant in which the stem produces significant secondary growth. This includes the formation of a periderm early on in the secondary growth stages, in which it is usually easy to demonstrate the location of the phelloderm, the phellogen, and the phellem layers. 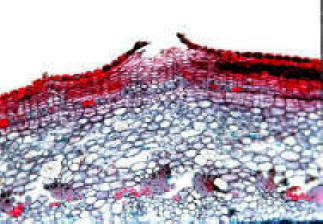 The periderm which is visible in the micrograph above, is called the first periderm in that it is formed in the outer layers of the cortex, immediately beneath the epidermis. It replaces the epidermis, as ongoing secondary growth starts to exert lateral pressure on the stem. Click here for a more detailed look at the components of the periderm and the inner cortex in this stem. Pelargonium species produce a ring of sclerenchymatous fibres, immediately on the inside of the starch sheath. These fibres are called perivascular fibres and in the example shown here, completely encircle the vascular tissue. They are also known as a pericycle. Click on the rectangle for more detail of these fibres. Prunus is a member of the Rosaceae, which includes a number of woody genera. 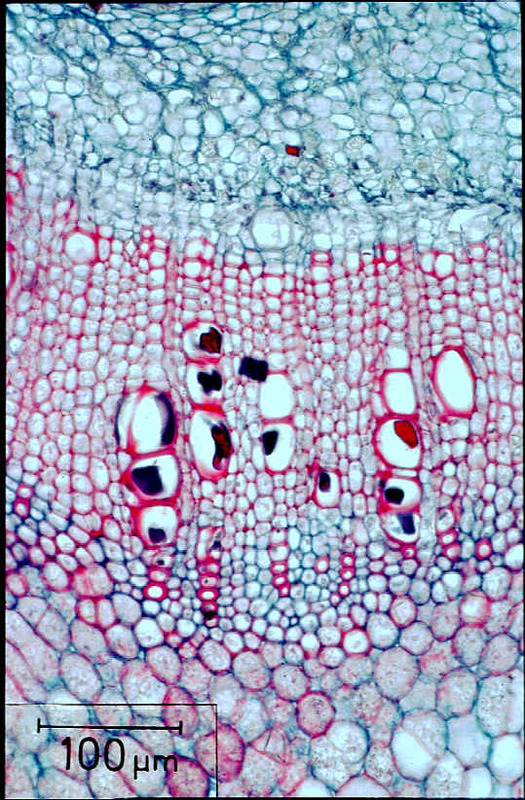 This cross section illustrates that the stem produces a great deal of secondary wood - which is typical of long-lived species. Vessels tend to be narrow-diameter and clustered into radially-arranged groups, separated by narrower tracheids and associated with predominantly homogeneous rays (in other words, similar to each other). 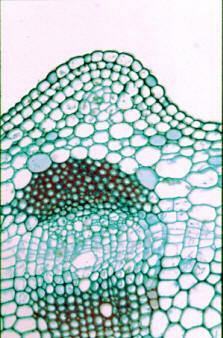 Examine the micrograph of the stem of Prunus. Note the occurrence of a periderm beneath the epidermis, the continuous cylinder of vascular tissue, and the position of the original primary bundles (hint: look for the protoxylem poles at the inner periphery of the ring of secondary xylem). Now look at the following details. Epidermis (primary). As the stem ages and increases in circumference, this tissue becomes ruptured and is sloughed off (i.e., is cast off). Periderm - a secondary tissue derived from a cambium, called the phellogen, which arises first in the outer regions of the stem, beneath the epidermis. The phellogen is formed due to the resumption of meristematic activity of the outer cortex, which is a parenchymatous hypodermis in this plant . Phellem (immediately under the epidermis). Radial rows of tangentially flattened cells derived from the centrifugal products of the phellogen. As they mature the walls become flattened into dry, dead scales, forming a cork-like bark. Phellogen or cork cambium of thin walled cells with living protoplasm. Phelloderm or secondary cortex, derived form the centripetal products of the phellogen. In your slide this layer is only one cell wide (immediately outside the first layer of collenchyma of the cortex). Note that this means that the phellogen, or any cambium for that matter, does not necessarily form an equal number of cells centripetally or centrifugally. Outer cortex (primary) of collenchyma cells. Inner cortex (primary) of parenchyma. Protophloem (primary) - crushed, opposite the original primary bundles. Metaphloem (primary) - note very clear sieve tubes and companion cells. 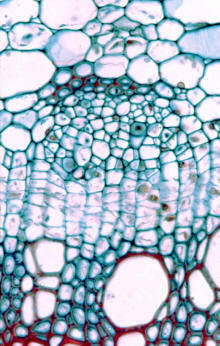 Secondary phloem, consisting of sieve tubes, companion cells and ray parenchyma, all arranged in regular radial rows. Cambial zone, consisting of the vascular cambium and one or two rows of incompletely differentiated centripetal and centrifugal products. 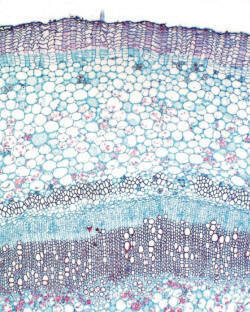 Secondary xylem of wide diameter vessels, thick-walled xylem fibres, abundant lignified xylem parenchyma, which makes up the vascular rays, can be recognized as rectangular thin-walled cells with cytoplasmic contents which lie in very regular rows passing through the secondary xylem and secondary phloem. Primary xylem, of metaxylem and protoxylem in its original position in the primary bundles. The parenchyma around the protoxylem vessels is not lignified. Interfascicular region, completely traversed by the vascular cambium and the secondary xylem and the secondary phloem produced by it. There is no primary vascular tissue in this region but much of the interfascicular parenchyma has become lignified. Pith (primary) of parenchyma, which has become lignified where it is in contact with the vascular cylinder. Secondary growth in roots is very different from that in stems. The major difference being that the central core of primary xylem remains visible, even in a cross-section of a very old root. The primary phloem is of course, lost during this phase of the plants life. Study the diagrams in Raven Evert and Eichhorn, Biology of Plants, if you are having trouble in understanding the process which takes place. At maturity, the primary xylem in the roots of dicotyledons forms a solid core with ridge-like projections This solid xylem structure is a throwback to a primitive arrangement called a protostele or haplostele. Strands of phloem alternate with the ridges. The number of ridges varies and in relation to this variation the roots are referred to as diarch, triarch, tetrarch, pentarch etc. If the xylem does not differentiate in the centre, a pith consisting of parenchyma or sclerenchyma results. A vascular cambium is produced partly by the residual procambium between the primary xylem and primary phloem, and also partly from the cells of the pericycle. This gives rise to secondary xylem initials centripetally and secondary phloem initials centrifugally. Continued growth causes the outer edge of the cylinder to become regular and ruptures the epidermis, cortex and endodermis. Cork or phellem originates from a cambium called the phellogen, first in the pericycle and later in the secondary phloem, providing a protective outer covering. (See phellem in stems for a comparison). Tetrarch (sometimes triarch or pentarch) primary xylem, with broad rays opposite the four protoxylem poles. Find the protoxylem poles. The continuous, circular mass of secondary xylem. The continuous cambial zone, outside a wide layer of incompletely differentiated xylem elements. The continuous circle of secondary phloem. The crushed and distorted primary phloem, split into more than four groups. The cortex, which should show signs of compression. The endodermis and pericycle are present but are rather obscure in this slide. No periderm has been formed. Note that the secondary phloem and secondary xylem are concentric, as contrasted with the alternating primary xylem and phloem in roots. Beetroot will produce limited secondary growth, particularly as the beetroot ages. It will become fibrous. The pea stem is much like any other soft herbaceous dicotyledon stem, in that its vascular bundles show very limited secondary growth, which is confined almost entirely to the vascular bundles. Click on the image to the left, to see this vascular bundle in more detail.